For those who know me, this will come as no surprise, but I love a good cup of tea. Much of my family is from Scotland, and I spent a lot of my childhood with my Nana. 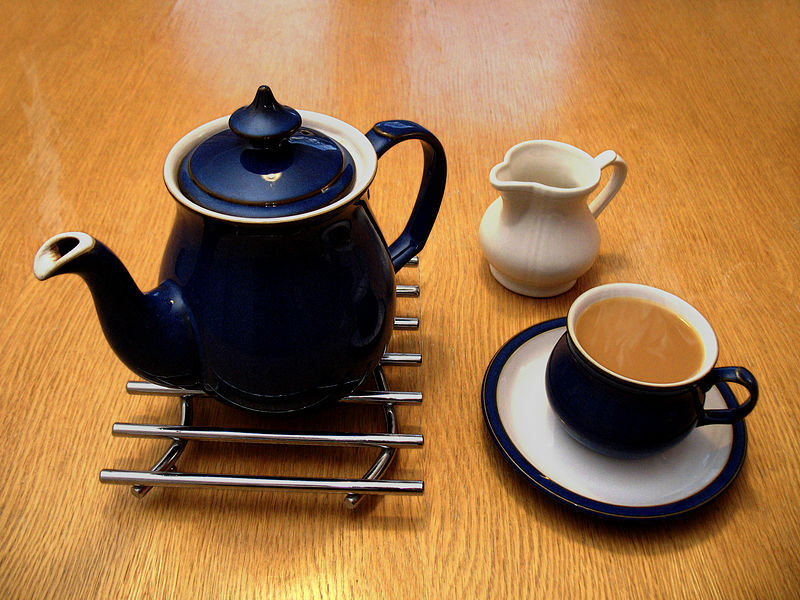 Tea was always served (and it was always Tetley). Since then, I’ve grown to appreciate herbal teas, green teas, and recently, rooibos teas. This has been made even easier since my wife began selling tea with Steeped Tea last summer, since we always have plentiful stocks of great loose leaf tea around. In our fast-paced, 21st Century Western world, we need everything fast. Our internet, our transit, our phone calls, and our food. Coffee shops have timers to ensure that everyone is served as quickly as possible. We rail against a webpage taking more than a second to load. Rush hour traffic is the closest we get to experiencing the darkest depths of hell. Why? Because we have things to do! Our increasing globalization has given us access to so many of the world’s treasures to experience. Social media has enabled us to maintain friendships with hundreds of people all around the world. We have practices to get to, shows to see, workouts to do, and work to get done. It can all be great things, but they build up quickly. In addition, we’ve made an idol of being busy. We consider people who only work 9-5 and have maybe one or two other routine engagements a week to be lazy. We consider it a great accomplishment to have fit an entire day, perhaps 16-18 hours of activities into one calendar date. Those people who can excel at this kind of life get to soar to the top of their passions, and those who don’t are ‘doomed’ to a life of mediocrity. But it doesn’t have to be this way, and I argue, in fact, that it shouldn’t be like this. Rest is an important part of life. We see this everywhere. Fields need time to rest and recover nutrients, so allowing fields to lie fallow is important to farming. The seasons show us the importance of rest by giving one quarter of the year (or perhaps FAR more for us Northern brothers and sister) to winter, when the world sleeps. Even our daily circadian rhythm asks that we have periods of action and periods of rest each day. In the Bible, rest is vital to our spiritual lives, built into the very Ten Commandments. We are to “Remember and keep holy the Sabbath Day.” It is important enough to God that he placed it with the other heavy hitters of moral instruction like having one God and not murdering each other. Jesus also models rest throughout His ministry. He took time away from the crowds to recharge and meet with the Father. Perhaps we should take note. Which brings me back to tea. For me, it can be an almost spiritual exercise to make a cup of tea. Clean, fresh water is where everything starts. I try to use just enough for what is needed (depending on how many people I’m making tea for). While the water starts to heat up, I take out whichever tea I’m going to enjoy and measure it into a teapot. Again, it should be just big enough for the tea required, no sense making more tea than you’re going to drink. Bigger is not always better. Then, we wait. Yes, we wait. I mean, you can go off and do something else while the kettle boils, but maybe taking a few minutes just to wait for a kettle can give us the time to slow down and take a few breaths. We can’t hurry the kettle, so we wait (and don’t even think about using a microwave, that ruins the whole thing…and makes sub-par tea…go ahead if you want to, just know that your tea is going to be less-than-awesome). When the water finally starts to boil, I pour it into the teapot. If we’re having green or white tea, I’ll pull it off just before, because water that is too hot will damage the flavour of the tea. But generally, I drink black tea, so a proper boil is where it’s at. Then, we wait again. It takes 3-5 minutes to properly steep a black tea. I may take that time to put milk and sugar into my mug, but that should be it. This is more time to just chill out and enjoy the smell of beautiful tea wafting out of your teapot. Do it, just smell that tea! Then, once I’ve let the tea steep, I pour it into my mug, and more waiting happens. Freshly poured tea is usually far too hot for me to drink right away, so we wait for it to cool down a bit. In the end, making tea is probably a 15-20 minute ritual. At our newly proposed minimum wages, that’s $5 of time spent making and waiting for tea. But I suggest that maybe that’s time that is well spent. Maybe if we take more time to enjoy little daily rituals, or even better, the time it takes to create real works of art, then we can move away from a mentality of ‘quicker, faster, cheaper.’ We can begin to enjoy real beauty and see the world as it really is, a portrait of God’s creativity. It’s not a whirlwind of blended colours and shapes that we glance at out our car window. It’s more than that. And maybe tea can show us.